Looking for customizable light strings? Frustrated what you see in stores? Need something that can give you professional length? These white Christmas light cords go the distance, and can be purchased in a variety of spacings and sizes. And with bulb color and finishes, the combinations are as varied as you can imagine. This style of lighting is what professionals use in business storefronts and residential installation. This cord is constructed using commercial-grade 18 AWG wire with SPT-1 insulation. Rated at 10 amps and wired in parallel, this spool can be cut to fit your project. You'll need 666 bulbs to fill every socket in this cord. Cord must be cut to limitations based on light line burnout and your breaker ratings. We suggest that you purchase 10% overage for glass bulb installation. Don't forget that these cords are not only for Christmas. Fill them with G30 or G50 glass or LED bulbs all year long for parties and special events. These cords are rated and warrantied for 90 days of normal seasonal use. bulbs - use with your existing bulbs or see our C9 Bulbs, and round bulbs with E17 bases (intermediate). Do not install more than 250 continuous feet of this Christmas light spool regardless of bulb type. Even if you are using LED bulbs, do not exceed 250 feet in a single string/run of cord. That is the line-limit specification of 18 AWG wire. If you are using incandescent bulbs, your maximum run is determined by the wattage of your bulbs. Do not exceed 1000 watts for a normal household breaker. Do not exceed 80% of the current rating for your breaker or a max of 10 amps for any run of light or combination of lights. Consult with a master electrician for verification of all electrical figures. Never strip this cord and wire-nut the end wires together. Ever. Don't ask us why we have to tell you this. Just ask an electrician if you have any questions about installation. We're sorry we have to mention this. 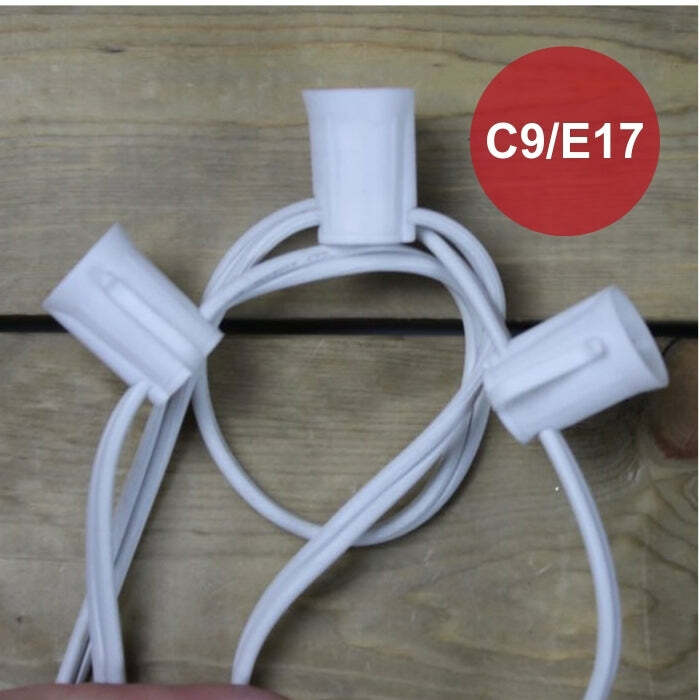 What is the difference in E12, E17, E26 cord? 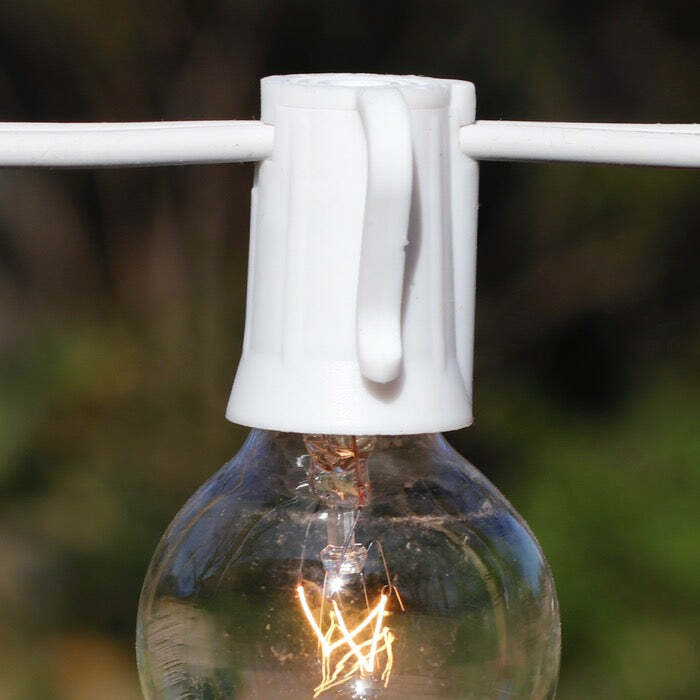 Will our cords work with your vintage bulbs? Can I mix incandescent and LED lights? How do I light my 20-foot tree? How long do you warrant your products? We warrant our products for a period of 90 days of normal seasonal use from the day you receive your order. Please test your lights upon receipt so if there is an issue we can resolve it as quickly as possible. See our Shipping and Warranty page for a full discussion of our policies. I've decided not to use the lights I ordered. What next? At the Christmas Light Source, we are dedicated to providing all our customers with the highest level of customer service and want you to be 100% satisfied with your purchase. We understand that, at times, returns happen. It is our policy that you must contact us within 14 days of receipt the shipment of your order to let us know you are returning your purchase. Lights that have been installed cannot be returned. Lights and bulbs must be returned in their original packaging in like new condition. Email us via our contact page with your order number or name and shipping address or reply back to your order confirmation email and we'll respond with the correct address and address format to direct your lights to our Returns Department. We will then refund your purchase less shipping when we receive your return. Returns must be received within 45 days of receipt of shipment to avoid a 15% restocking fee and returns are not accepted after 60 days. Stay in the loop! Sign up for our mailing list today.